Photo of the Week.. 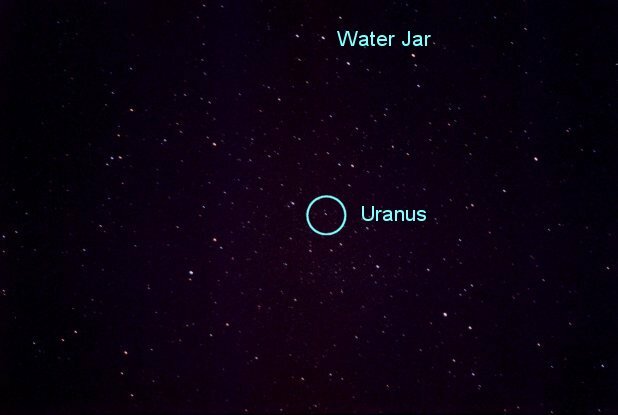 In late 2004, Uranus lay just to the south of Aquarius's Water Jar (or Urn), having moved there from Capricornus. Astronomy news for the week starting Friday, December 17, 2004. The Moon, in its perpetual cycle around the Earth, passes through its first quarter on Saturday, December 18, shortly before its daylight Moonrise in North America, at which time we see half the sunlit face of the Moon, while the other side -- that facing away from the Sun -- is in darkness. The morning sky remains a marvel, with all five ancient planets on display in order of their distance from the Sun. Near the horizon, Mercury glows in bright twilight, below and to the left of brilliant Venus (which now rises in the southwest just before twilight begins). Up and to the right of Venus, you can spot reddish Mars in Libra. Higher still is obvious Jupiter, in Virgo, which now rises around 1:30 AM. Quite a bit farther over in the western sky is the most distant of the planets known since ancient times, Saturn, in Gemini. Rising just after twilight ends, Saturn is the lone bright planet in the evening sky, though the progression continues with faint Uranus and Neptune (which now set in mid-evening). Wrapping around to the other side of the Sun (and into the morning hours again), the progression ends with currently invisible Pluto. All that is left out is the Earth, which will actually take center stage when the Sun passes through the Winter Solstice in Sagittarius at 6:42 AM Central Standard Time (7:42 EST, 5:42 MST, 4:42 PST, 3:42 Alaska, 2:42 Hawaii) on Tuesday, December 21st, about or before the time of sunrise. At that moment, the Earth's axis is tilted directly away from the Sun, astronomical winter begins in the northern hemisphere, the Sun is overhead at the Tropic of Capricorn, is circumpolar (not setting) at the Antarctic Circle, and barely makes it to the horizon at the Arctic Circle. Though the Sun will now begin its long, six-month, trek to the north, the days in the mid- northern hemisphere will continue to chill as the northerly movement is at first so very slow such that the solar heating rate remains low until spring approaches. The stars of winter join in and are fully with us, Orion now up above the eastern horizon as evening twilight comes to an end. Up and to the right of him is an icon of the passage from autumn to winter, Taurus the Bull, whose head is formed from the Hyades star cluster and the first magnitude star Aldebaran (which is not actually a part of the cluster, but a foreground star). Taurus is perhaps best known for containing the exquisite, more distant cluster called the Seven Sisters, or Pleiades, of which six stars are readily visible. Directly above the Pleiades, to the north, is bright Perseus, whose most famous star is the eclipsing double Algol, the "Demon Star."